Are You and Your Home Speaking the Same Language? I have a confession to make. I don’t always practice what I preach. I am the biggest advocate for creating a home that nurtures your most contented self. In fact, my career involves helping people do this on a daily basis. In a sense I’m like the shoemaker. It’s not that my home is a total disaster. There are rooms I absolutely love being in and most areas are properly organized. However, I don’t feel greeted when I open my front door and, although my kitchen is washed in beautiful sunshine most days, I don’t have the gourmet aspects I crave- yet. I used to tell myself my next house would be the one I’d really make into a home. This house was only temporary and I didn’t want to sink a bunch of time and resources into it. It was okay that it didn’t reflect our family and that it wasn’t my dream home, because I would have that in my next house. How many times have you told that to yourself? By tapping into your instincts and noting your reactions, you too can create beautiful rooms that nourish your eye and nurture your soul. Picture yourself returning home after being out. Your home is in its natural state- orderly, chaotic or somewhere in between. As you’re about to enter through the door, notice your mood. Are you feeling relaxed, anxious, happy, tense or depressed? What comes to mind as you step into your home? Write down your feelings on a notepad. Picture yourself walking through the rest of your home, room by room (you can do this physically as well). Write down each room or space and note how your mood changes with an adjective. For example, does the smell of fresh citrus in the kitchen make you feel energized, yet the disorganized bills in the office make you tense up? Perhaps the crisp white linens on your bed make you feel serene, yet the pile of shoes in your closet drives you crazy. Beside each room you recorded on your notepad, give a rating from 0 to 10 representing how you feel in the space. For instance, if you avoid going into your office because it’s such a mess, give it a score of 0 or 1. A room you feel neutral about gets a 5 and your favorite rooms get a 9 or 10. Starting with the lowest number on your list (if there is more than one, choose the room you spend the most time in), stand in the space and look around. Observe how different elements in the room affect your mood. For instance, you may find the appliances in your kitchen pleasing, but the wall color is drab and the countertops look bare. Consider all five senses, functionality, organization and any association you may have to the room, such as a guest room where your grandmother used to stay before she passed. Record your findings. After you have assessed your least favorite room, write as many adjectives you could use to describe the space. For example, your family room could be cold, sterile, disorganized and boring. Next, write down a list of antonyms for the words, such as warm, inviting, organized and interesting. List any decor elements that relate to the feeling you want to create in the room. For instance, you could add decorative pillows, storage boxes, candles, family photos, table lamps, warm grey walls, a cashmere throw, etc. to the family room. Now that you have your list of elements to create a harmonized space, create a plan, including a budget, list of required changes, items to shop for, timeline, and who is going to complete each task. By transforming the space from an emotional downer to a source of uplift, it will bring positive energy into your life and give you the energy to tackle another room. It becomes contagious. Tip: After you’ve created your list of finishes, decorative elements and whatever else you need to transform your room, create a mood board to make sure it all works together. 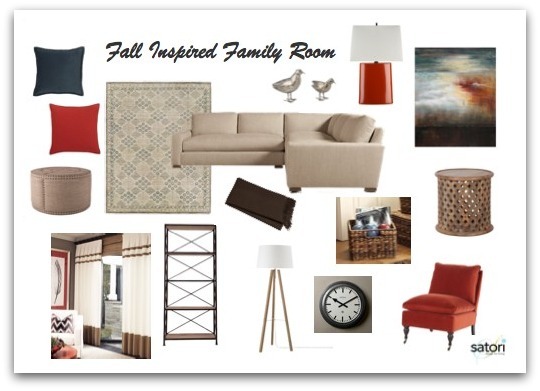 Update- Get the details of this family room design. Do you have a room in your home that evokes negative emotions? Or have you recently created a positive, feel-good space? I’d love to hear about it! Love your ideas on approaching room design. Our master bedroom causes me grief. It doesn’t give the warm, serene feel a bedroom should. I’m going to try the steps you suggested to make some changes. I really like the colors you’ve chosen for the family room design you’re working on! Great to hear that you’re going to make some changes to your bedroom. Let me know how you make out! Yes, I think the family room is going to be gorgeous! Great post! I definitely felt the same way about my home office. Outside of working hours, I avoided the stuffy, drab and disaster of a room – and whatever you are picturing it was WORSE! Excellent tips to help someone digest the rooms in their house! Great step by step! I definitely have a problem identifying why I don’t like certain things, but I think coming at it from a different angle will help. Great resource!